BAT - BLOG : BATMAN TOYS and COLLECTIBLES: BATDAVE & BUSTER: THE MOVIE - The #1 Batman Fan-Film From New Jersey! 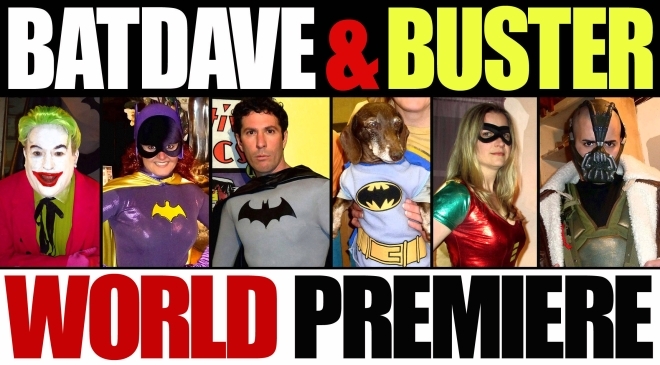 BATDAVE & BUSTER: THE MOVIE - The #1 Batman Fan-Film From New Jersey! PLOT SUMMARY: A regular guy from New Jersey and his loyal dog who both constantly try to emulate the crime-fighting ways of their hero 'The Batman' find themselves drawn into a wacky manhunt for The Joker and a brutal fight to the death with Bane. Fueled by a budget of only 400 dollars and pure, unstoppable determination, the latest project from BatSquad Studios features a 'non-actor' cast comprised entirely of friends, family members, fellow Batman fans, and talented regional cosplayers. Filmed primarily between November 2012 and April 2013, this labor of love only exists due to the good people who willingly volunteered their time, energy, passion and a few really cool Batmobiles along the way. Special thanks to every single cast and crew member, John Brown and his Gotham City Supercars Club members, BatChick Lisa, Brooklyn John, Tommy Brookshire at Bat-Blog.Com, and my film-making, partner-in-crime Dennis Pellicano for their amazing assistance in making this crazy little daydream finally see the light of day. This is 'BATDAVE AND BUSTER'! !